We are lucky to have a small river bordering our property. Sometimes we have a free minute, and, whenever we have it, we go down there for a few casts. Our usual catch are small things like this bass, and I cannot tell you how grateful we feel for it. Deep fried in ghee, it makes the most delicious fish dish ever. 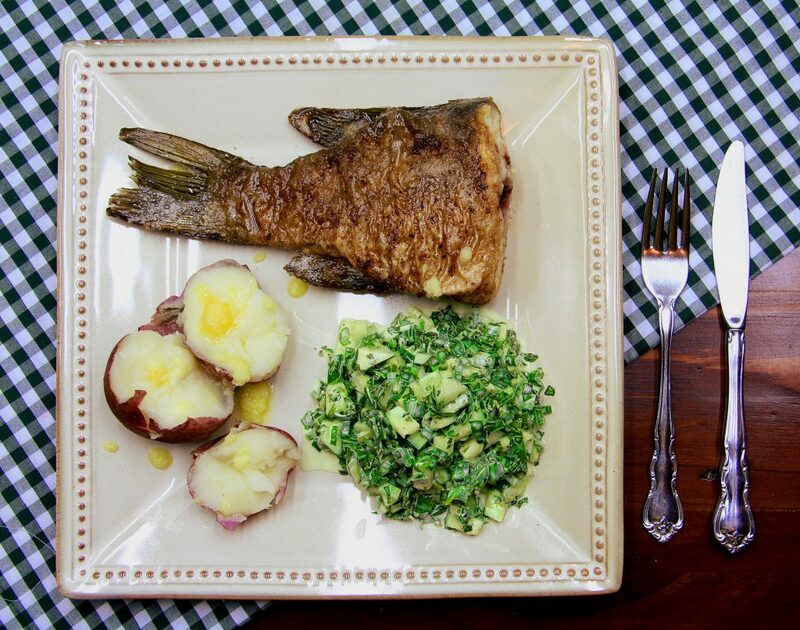 This one, with a side dish of young potato in skins and a fresh salad from garden sorrel and cucumbers, made a restaurant worthy dinner for two. Nothing tastes better that the food you grew, harvested, foraged yourself! Clean the fish, remove the scales. Cut it in half (or in portion size pieces, if the fish is bigger). Sprinkle each piece with salt, rubbing it lightly into the skin and dredge with white flour. Place in a preheated skillet with a generous amount of ghee. It takes about 10 minutes to fry the fish through. First 5 minutes fry it without a lid on a medium/high heat. Flip the pieces over as soon as they form a nice crust. Place the lid for the last 5 minutes of frying and reduce the heat to allow the fish to cook through. Flip the pieces couple times during this period. Remove from the heat and let fish rest in the covered skillet for a while. White fish goes excellent with sour taste. Garden sorrel, combined with fresh cucumbers and scallions is a perfect match. Dice cucumbers finely, sprinkle with salt, set aside in a colander for 2 minutes to remove the excess liquid. Shake cucumbers well before combining with the rest of ingredients. Wash thoroughly garden sorrel, dry it completely and chop finely ( I do not discard stems as long as they are not too tough). Squeeze chopped sorrel gently until it becomes soft and begins to release the juice. Chop finely a bunch of scallions. Combine drained cucumbers, sorrel, scallions, garnish with sour cream and sprinkle with salt to taste. Serve with potato boiled in skins. And, please, never throw away a small catch any more!